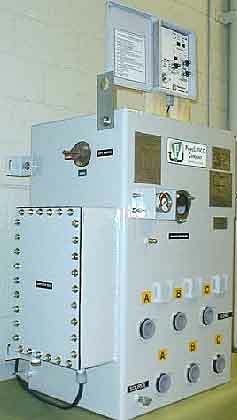 These Vacuum Interrupter Switches are designed to combine the total cost and operational benefits of fuseless, electronically controlled, re-settable overcurrent protection, and re-settable inrush restraint with the safety and maintenance benefits of a totally sealed, dead front, SF6 insulated device. They provide automatic three phase fault interruption with manual loadbreak and sectionalizing capabilities for distribution systems rated from 15kV to 27kV with up to 600A continuous current and 12kA symmetric fault interrupting. Powell-ESCO Company, 3200 Frontage Road, Greenville, TX 75402. Tel: 903-455-6234; Fax: 903-455-3807.